Cats really are unique in their nutritional requirements. They are true, obligate carnivores which means that they must eat the meat of game animals or prey. They usually eat the whole carcase and in doing so they achieve a balanced and complete nutritional intake. When it comes to feeding them at home, it’s the commercial foods that achieve this best of all. Why? -because they have been manufactured to meet their nutritional requirements. If you were to just feed meat to a cat you are literally carving the muscle of the carcase and feeding them only this portion, whilst denying the rest of the carcase -which houses many of the goodies. For example you won’t find a cat catching a mouse and just filleting out the fillet steak and moving on. Instead they eat a substantial amount, if not all of the carcase- and then they move on. Unappealing as it sounds , this is what cats do, and to mimic this you are better off feeding the commercial foods; they more closely resemble what they eat in the wild because they have a wider range of ingredients. So this makes feeding cats really simple because you just have to feed a combination of dry cat biscuits and canned food and you have accomplished the main goal. The supermarket biscuits are OK but are mostly based on cereal proteins such as corn, maize and oats with chicken flavouring or chicken by-products added. The super-premium cat foods however are always meat-protein based and would be the better choice. The super-premium grade biscuits not only contain real animal proteins but they usually have antioxidants added as well. Furthermore the Omega6 and Omega3 fatty acids are also included to promote health. You can always tell which cats are eating these foods by just looking at their coat-these extra fatty acids result in much glossier coats. 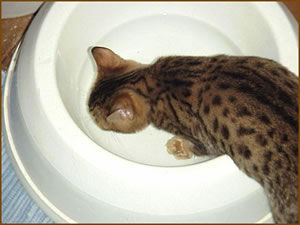 The wet foods supplied in tins or pouches also have benefit to cats. They are an excellent source of moisture and can offer a complete and balanced diet as well. Their protein quality is often not great but this can be countered by feeding a high quality dry food at the same time. Often they are the only way you get a pill into a cat as well! This does not mean they can not eat real meat, fish and chicken as well, it’s just that the commercial foods should be the backbone of their diet. Real meat is actually a great source of high quality protein for a feline.It should only be given in moderation however or cats get really fat on it. And remember if given alone, the cat is subjected to an incomplete and unbalanced diet. FINALLY DON’T FORGET WATER: this is really important to ensure good kidney function in the cat and helps to prevent bladder problems. It is a good idea to have water in several places around the house and to observe where their favourite drinking place is; you can then keep their water replenished in this place all the time. Also put some containers around the garden as they seem to enjoy drinking from these places as well. There are many essential items that cats require in their diet because their metabolism is incapable of manufacturing them; (just like we require Vitamin C in our diet because our body can not manufacture it) -probably because they are used to eating game that has pre-manufactured everything for them already. There are many amino acids-the base units that make up proteins- that can not be manufactured internally by feline metabolism. Amino acids such as taurine, arginine and tryptophan must be present in the diet. Again they are readily available in meat and commercial foods. Secondly, cats have a very high protein requirement; unlike other species their metabolism allows them to convert proteins into glucose. The cat has a very high fat requirement compared to us and there are certain fats they need in the diet that they can not make themselves i.e. essential fats. The main one is arachidonic acid, a fatty acid that is the major constituent of all cell membranes. Fortunately it is present in high levels in meat. Carbohydrates in the food can not be readily utilised by cats – which is why they won’t eat a sandwich or a doughnut (but a dog will!). Hence cats do not require a high level of carbohydrates in their diet as an energy source. Instead they derive most of their energy from fats and proteins.